When you think of Chanel you instantly think of the iconic Chanel Classic Flap Bag which is absolutely gorgeous and timeless. The Chanel Classic Flag Bag comes in 7 different sizes (ranging from Maxi to Extra Mini), and the Chanel Mini Rectangle is one of the smaller sizes. Let’s chat about the highly sought-after Chanel mini bag and my experience on how I came to get my hands on this sought after mini bag! I really had my heart on buying a Chanel bag from the Chanel store. The number one reason being that you know that the item you are getting is 100% authentic complete with an authentication card and of course, the beautiful packaging. 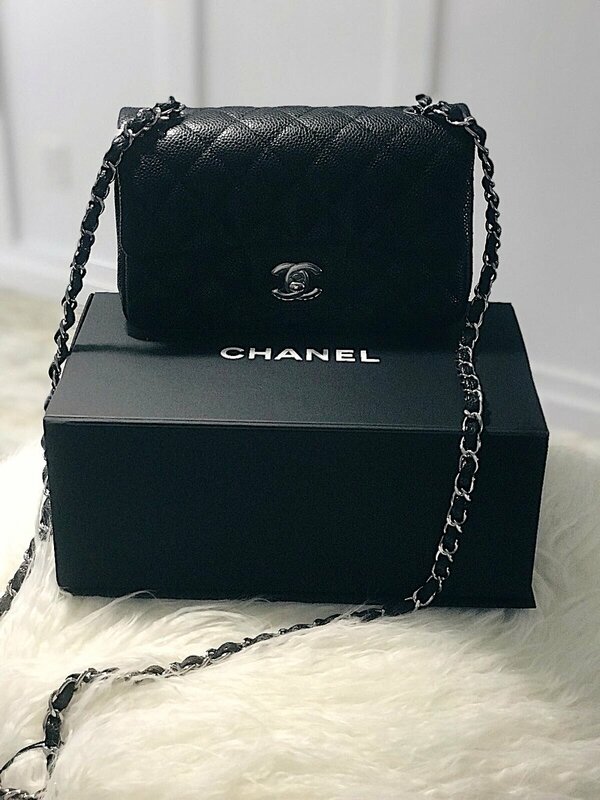 I was initially looking into purchasing the Chanel Wallet on Chain (WOC) but I really wanted a bag that had the look and feel of the Chanel Classic Flap Bag. I love the size of my Saint Laurent Monogram Mattelasse Leather Chain Wallet which is: 8.75” x 5.5” x 1.5” so I knew I wanted a similar bag but in silver hardware. So in came the Chanel Classic Flap Mini Rectangle Bag with dimensions of: 8” x 5” x 2”. For material I decided to go with calfskin. It’s honestly all about personal choice and use. Lambskin is very soft but is fragile and can easily scratch. Calfskin (or caviar) is a harder material but is durable and doesn’t scratch easily. I went with the grained calfskin with silver hardware as it is more durable than the lambskin and not as prone to scratches. Since this Chanel Classic Flap Mini Rectangle Bag would be one I would wear out at night I wanted something that wasn’t as prone to scratches. Now something that people never tell you is that tracking down these bags are not easy. Unfortunately in Philadelphia there are no Chanel stores and not even the King of Prussia mall has one. The nearest location is New York City but I did not want to take the chance of going all the way there and leaving disappointed. So I literally picked up the phone and started calling every Chanel store without any luck. Well in the meantime my wonderful husband had a contact over at the Chanel store in New York City! The associate had white, pink, and red in the Chanel Mini Rectangle bag but I really wanted to wait as long as it took for the bag in black. I literally waited months until the sales associate called to say that they were getting the bag and if I was still interested. Once the bag arrived I was so excited to open it up! After opening up the box and seeing the bag in person it was definitely love at first sight and this mini bag is such a beauty. I definitely made the right decision. The Chanel mini has enough space for all your day to day necessities. I am able to store my ID, credit cards, iPhone 7, lipgloss, and any knickknacks comfortably in this bag. Some of my initial thoughts on the bag - it’s seriously the perfect luxury addition without it being too much. The bag is built very well and is sturdy (with the pricetag you wouldn’t expect anything less). The purse has the classic CC interlocking design and a back pocket. The bag is also very versatile. It can be worn long, crossbody, or as a clutch. Also the chain can even be wrapped a certain way for you to carry it as a shorter shoulder bag which can be used as a formal look. I am 5’7” and the chain length of the bag is perfect for me (I believe the chain length is 23”). Overall, I love the Chanel Mini Rectangle bag. It has a the look and feel of a bigger Classic Chanel Flap Bag but at a smaller size. I love that it’s such a versatile bag and that I can wear it many ways. The price of a Chanel bag increases each year, however, it’s definitely an investment piece!